Google announced on Monday October 8 that it would be shutting down it's social network Google Plus. 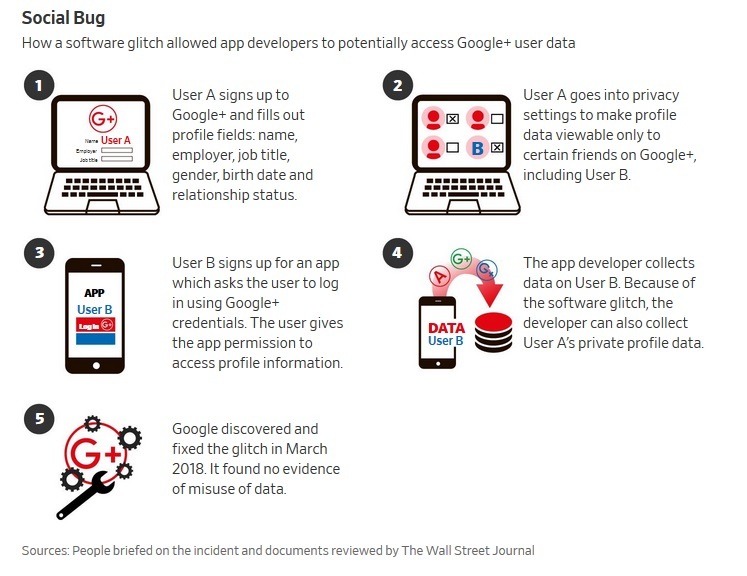 This announcement came shortly after a Wall Street Journal article that there had been a data leak affecting a half million users, and Google made the decision not to warn people fearing disclosure might mean bad press and possibly increased regulation as a result. "The snafu threatens to give Google a black eye on privacy after public assurances that it was less susceptible to data gaffes like those that have befallen Facebook," the WSJ stated, "It may also complicate Google's attempts to stave off unfavorable regulation in Washington." 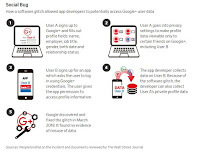 The data leak "was the result of a flaw in the API Google created to help app developers access an array of profile and contact information about the people who sign up to use their apps, as well as the people they are connected to on Google+." Due to the bug, "developers could collect the profile data of their users' friends, even if that data was explicitly marked nonpublic in users' privacy settings." Because the problem was discovered in March, it does not fall under Europe's General Data Protection Regulation law, which went into affect in May. If it had, Google would have been required to inform about it within 72 hours or risk being fined up to two percent of it's global revenue. But it's refusal to come clean right away means it could "face class action lawsuits over it's decision not to disclose the incident. ... 'The story here is that Google knew something here, and hid it.'" Google Plus was launched in June 2011, seven years ago. In 2015, it had 111 million active accounts. It is not being shut down right away, but will be "phased out" over ten months. Maria Korolov of Hypergird Business stated that the social media service was important to many Second Life and Opensim users as unlike Facebook it accepted the use of online pseudonyms, "Without Google Plus, the OpenSim community will be left without a viable social networking platform," at least one where they can freely use their avatar names. How the Opensim community will adapt remains to be seen.